Lessons learned provides a repository of lessons learned documents from the D&D community. The purpose of lessons learned is to bring together insights gained during a project that can be usefully applied on future projects. Capturing lessons learned from projects is key for any organization. By capturing lessons learned, the D&D community can achieve far greater long-term success than if the lessons are left undocumented once a project ends. Registered D&D community members are encouraged to contribute to this digital library of lessons learned. The lessons learned module includes a search feature to allow the user to search the database and the full text of stored documents. 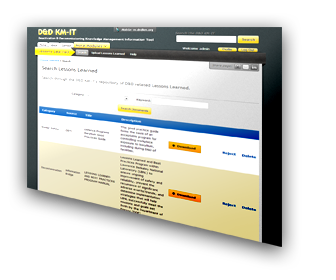 The results will provide links to the documents which can then be viewed and saved by the user. The Environmental Management (EM) Office of Project Management (EM-5.2.2) is responsible for analysis and distribution of “EM Project Management Lessons Learned.” In October 2013, EM-5.22 began distributing Project Management Lessons Learned Bulletins monthly to highlight specific lessons learned applicable to many projects and to solicit future lessons learned from project teams willing to share their experiences. EM-5.22 created this content area in order to assist with archival and distribution of the lessons learned bulletins. Additional content will be added in the future, so please check back regularly. If you have any comments or suggestions for content, please contact Rodney Lehman, EM-5.22, Office Director (Acting). Start searching the Lessons Learned module.